A great place for a summer picnic on the edge of the North Downs – dine while taking in fantastic views across miles of heath and woodland! 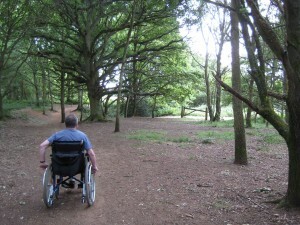 It also provides opportunities for short wheelchair walks. The car park is rarely busy: we picnic on the slope beneath its southern edge, where a small tree provides shade. There are many towns and villages within the 25 square miles or so you can see from this spot, but they are scarcely visible, being hidden in the hollows and woodland. There is a designated picnic area to the north of the car park, but this doesn’t offer the spectacular view and – when we last visited, at least – its fringes were remarkable for the huge quantities of dog dirt. Clearly many dog owners don’t care about the mess their animals leave behind. 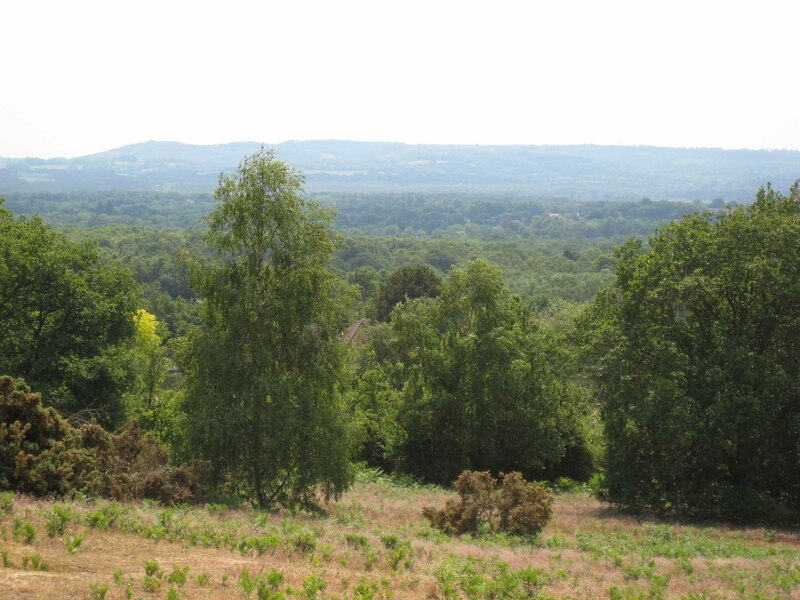 Puttenham Common is managed by Surrey Wildlife Trust and is a Site of Special Scientific Interest (SSSI). Parts are also of high archaeological interest: substantial finds have been recorded from every period except Saxon. The main archaeological feature is the hill fort at Hillbury (at the northern end of the Common) which is a Scheduled Ancient Monument, probably dating back to the Iron Age but with greater evidence of occupation during Roman times. The Common is primarily heathland, with shrubs such as ling, bell heather, and gorse in the more open areas. Some of the heathland is reverting to woodland scrub and woodland. 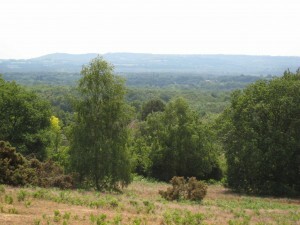 To counter this, Surrey Wildlife Trust is engaged in small-scale tree removal, and bracken and scrub removal. This work is supported by DEFRA and Natural England. Puttenham Common has a large number of public rights of way. The Top Car Park occupies part of a plateau, from which paths lead downhill towards the west and north-west. 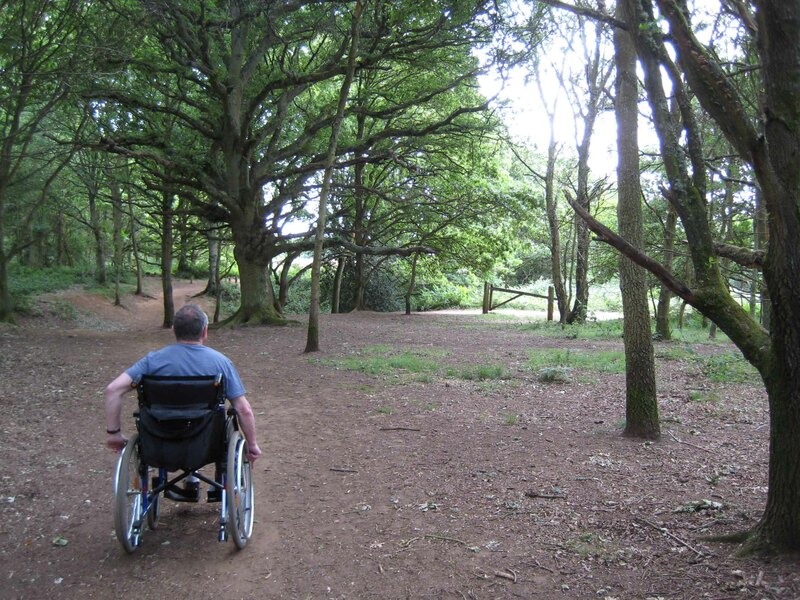 Those walking with wheels may wish to avoid these slopes by confining themselves to the flat woodland and heathland to the north of the car park. Take the well-worn path heading north-west, alongside the picnic site. There is a dip when you enter the trees and wheelchair users will require assistance at this point. From this point you can then take the path on the left onto heathland. There are many paths providing level walking across the heath. If you see you are approaching a slope downwards, just take another path to stay on the level. You’ll have a pleasant circular walk! The woodland path, heading south. The dip is ahead, the access to heathland on the right. Alternatively, from the dip described earlier, you can turn right to reach a gravelled track. Turn left along this track, which passes through a wooded area. You can make this a circular walk by joining another (unsurfaced) path on your left after about ten minutes. This path winds through the trees to the dip, from where you can either turn right across the heathland (as described above) or proceed ahead, back the car park. Turn off the A31 (Hog’s Back) onto the B3000, heading towards Compton. Very shortly, turn right into Puttenham village, then take the first left (after the church) towards Elstead. The entrance to the Top Car Park is on the right, a little over 1km (0.7 mile) from the village. We found a dead badger near to pillons a little way from top car park on Sunday 5th Aug. This may effect other wild animals and dogs plus it would distress children. Who is responsible for removal? If you would care to phone us we could give more details of exact location.